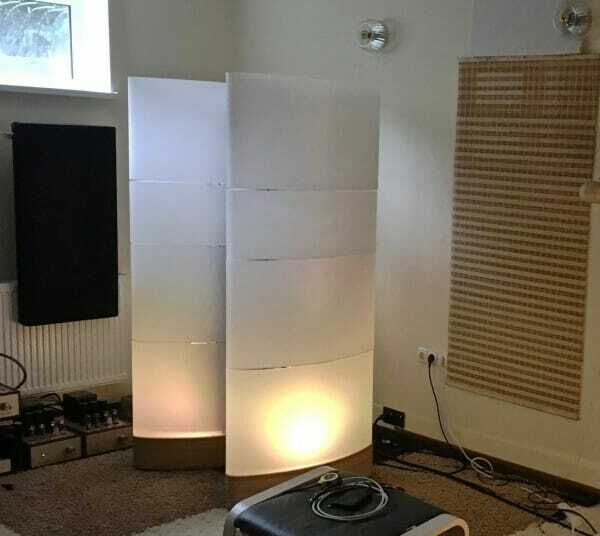 Listening and testing takes years to know exactly where to place your loudspeakers. 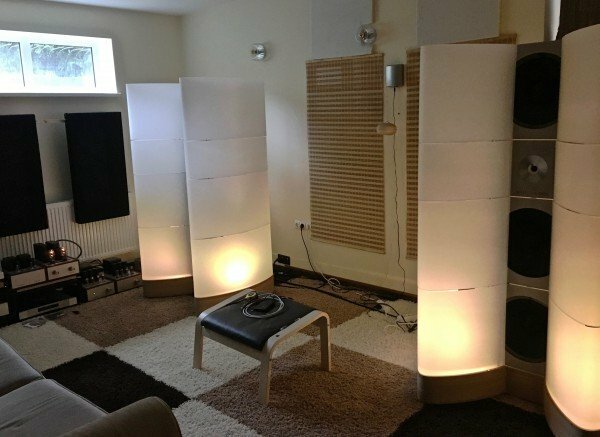 I have written this ‘WOLFVONLANGA audiophile set up’ article to help you understand what a difference is made by repositioning your loudspeakers. The system I am writing about was set up in Vilnius, Lithuania and the loudspeakers were from the WOLFVONLANGA open baffle design. The article will describe some of the faults I found in the original loudspeaker positioning and the corrective steps taken. The initial sound I gave a score of 5/10 but after the adjustments the score was 10/10. The system had been burning in for just over a month. I had been invited over to my friends to listen and give an honest evaluation. This picture was taken as I entered the listening room. And would be used as the reference setup for making a necessary adjustments. The loudspeakers were large and maybe too large for the size of the room. But I have to say I was impressed by the look and feel of the loudspeakers. I was actually expecting to be literally ‘blown away’. I sat down as the first CD was inserted. The music played but, the sound I heard was nothing like I was expecting. My friend told me he used his computer to set up the system. And was interested to hear how my thoughts. As you read, I think you will understand what I think about the computer set-up in this particular event! The sound I heard was completely wrong and everything was out of balance. The bass was booming and overbearing. The vocal appeared from two-thirds of the way up the wall. The sound stage was small and nothing was happening in the middle. The small musical details were appearing from the far wall and there was no feeling whatsoever in the music. The sound was lifeless, flat without expression. Also it was apparent that when a note was played it was quickly cut off. The picture above shows the initial position of the loudspeakers upon arrival. The left speaker was too far away from the rear wall. And was also too far away from the right hand speaker. The toe-in angle was completely wrong, causing problems. Such as reflections, hole in the middle, loose booming bass and vocals appearing two thirds of the way up the wall. The first task was to move the speakers 25 centimeters nearer to the rear wall and 25 centimeters closer together. Luckily the units were on wheels the move was easy. Also the initial position I chose turned out to be very good. As you can see from the picture, the move was large in comparison to the room size and listening position. I wish to point out it is only necessary to move a loudspeaker just a few centimeters. And then fine tune by moving just one or even a half centimeter at a time. By moving the toe-in angle a very small amount, it was possible to have the vocals exactly at ‘center stage’. And so nice to hear Rod where he should be and not half way up the wall! The loudspeakers had to have a very small toe in which was about one centimeter off center and this was enough to make the sound dispersion correct. Also, the loudspeakers ended up with exactly the same measurement from left driver center to the right driver center. This measurement was the same as the measurement from the listening position to the center of the loudspeakers. And so creating the ‘sound triangle’. The initial adjustments had been completed and we took turns to sit in the listening position to hear the results. A few more small adjustments were made and the system started to sound really good. The bass was tight, The vocals were center stage and the sound stage excellent. The system was now up to 9/10. But something was not sounding quite right. If you remember earlier I said the notes seem to be somehow cut off and there was a certain lack of life to the music. My friend had many different cables he had collected over the years and we started to try different combinations. First the power cords as these are normally the culprits. Now I am even more impressed with the difference cables make. Because that was all it needed to bring the system to life! The music had feeling and vitality! My friend put on Rod again just to hear how he sounded. Everything was great. I even found myself singing along with Rod as the harmonies came in! They say there is a first time for everything. And I think the sound from the WOLFVONLANGA audiophile set up really got to me in a big way. Rod was real, as if he was in the room with us and the sound we heard was now a full 10/10! The WOLFVONLANGA audiophile set up was a complete success and my friend was very pleased with the results. And we both agreed the computer setup was far from correct! I also was very pleased with the results because it gave me another story to share. With any system the first thing you should do is position your loudspeakers. This is something that is often overlooked. People spend thousands on their systems but are not getting the full enjoyment. This is because they have not been informed about the importance of this basic procedure. Another item which is often overlooked is the audio cables. Are your cables suited to your system. Meaning the quality and the build build. Have you checked to see all the power cord polarities are the same? And do your cables add or take anything away from the original musical signal! Amazing and would love to hear a system like this ! does sound better than Tannoys!